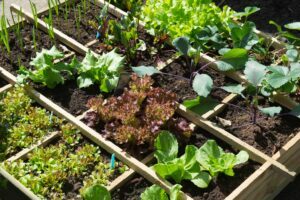 If you want to grow a great garden on a budget, it is time to get started. Having a good plan for what you’ll grow is key to avoiding overspending. I’ve come up with a few strategies to make your great garden more affordable and successful. 1. Grow from seeds, not small plant starts. Consider that a six-pack of lettuce seedlings usually runs between $3 and $6, while a pack of 500 lettuce seeds costs less than $3. It will take more time for you to see results when you start with seeds, but sowing seeds directly in the ground will take no more time than it will to plant seedlings. Shopping for seeds can be fun, and if you’re selective you can find some great deals. 2. Seek out clippings. It is near impossible for most to grow blueberries or many trees from seeds because they are propagated asexually. The good news is many perennials, shrubs, vegetables, and trees are easily grown with clippings. Ask someone who has these plants for a few pencil-size sticks from their plant. Then pot them in moist perlite, and within a few weeks you will see roots and leaves emerging. 3. Re-purpose and recycle your materials. Fortunately, one person’s trash is another’s treasure. Planters can be created with an old bathtub or from used wooden pallets. Turn an old bed spring into a trellis, or instead of using expensive flagstone, try broken concrete and dye the surface for a more attractive finish. When you are at garage sales and thrift stores, keep your eye out for inexpensive items you can use in your garden. 4. Rummage for gardening supplies. Bamboo poles which are used for tomato stakes and fences can run between $1 to $10 each yet those who have bamboo in their yard knows that it grows like a weed. Ask if you take some of it off their hands. So every time you think that you need to buy materials, think about where to get a free or almost free option. 5. Engineer your own design. Hiring a professional garden designer can run several thousand dollars. Head to the library where there are volumes of garden design books that will tell you exactly how to accomplish anything you can dream up. Draw your design on paper, as accurately as you can. Give yourself plenty of time to visualize your ideas in detail before you start building. I’ve used flour to map out my garden before I have started planting. 6. Make your own amendments. Buying bags of compost and fertilizers can really add up. I don’t know many people that have their own livestock for a manure source but, with a little searching, you can find someone local who will let you clean out their barn. Mix the manure with wood shavings, grass clippings, leaves and then pile it up and let it stew until it turns into a rich black compost. For extra nutrients, save your eggshells and crush them into the compost (adds calcium and phosphorus). 7. Look for free compost and mulch. Tree-trimming companies usually have piles of mulch on hand that they give away for free. Most cities convert their green waste into compost and mulch that they then give away for free at the landfill or sell for a small fee. Head to Starbucks for free nitrogen-rich grounds in lieu of expensive fertilizer. Just sprinkle on soil and let it percolate in. 8. Become a “Free List” watcher. Craigslist and other sites have a “Free Stuff” section that is a great source for everything from live plants to pots to piles of compost. 9. Grow Organic. Sticking with natural methods can have financial benefits. You can take a small amount of dish soap in a spray bottle of water to get rid of smaller bugs. Pesticides will always cost money, but attracting beneficial insects is easy and completely free. This also applies to herbicides: You can remove pesky weeds by hand, smother them to death under black plastic, or layers of cardboard and wood chips. 10. Start small – get confidence with one or two plants and then slowly expand. Artichokes, Arugula, French Beans, Beets, Chard, Zucchini, Garlic, Kale, Kohlrabi, Leaf Lettuce, Onions, Parsnips, Pumpkins, Radishes, and Squashes. 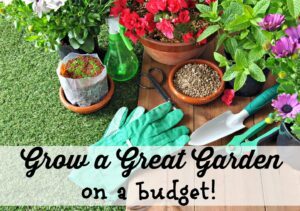 You can have a great garden on a budget. If you have kids at home, get them involved. Gardening is a wonderful family activity and vegetables grown at home taste so good! You can get to know your neighbors by sharing your surplus bounty. 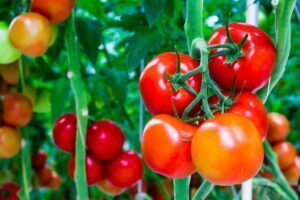 Use the site ampleharvest.org to find places where you can donate produce from your garden. If your zucchini or tomato plants are over -achievers, go forth and donate!